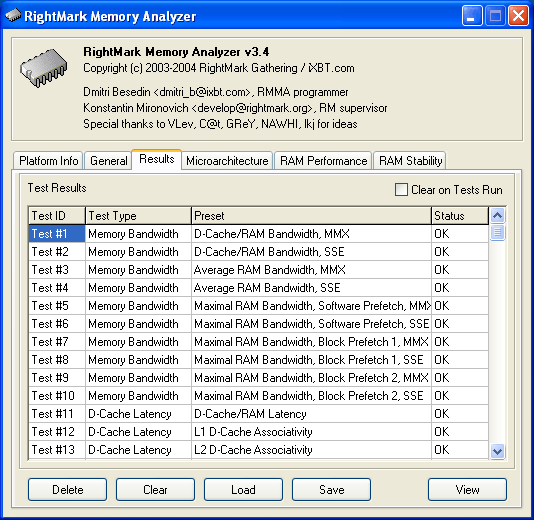 RightMark Memory Analyzer has been lacking arrangement and browsing features for its multiple low-level test results for a long time. Well, that's the general benchmark development specifics – you have to develop, test, and debug (and modify if necessary) as many test methods as possible – to increase flexibility and expand the areas of application of the benchmark, and only after it to improve user interface. At last there has appeared an opportunity to improve it – the seventh RMMA release, Version 3.4, has several modifications that improve its user interface. You will see the modifications as soon as you run the benchmark – there appeared a new tabbed page, called Results. It's not difficult to guess that it contains a summary table of test results (in our case – results of the batch tests), where you can handle the results. Let's briefly consider the latter, though they are practically not different from operations with batch tests, which can be found on the General tabbed page. Clear on Tests Run – enable/disable removing previous test results when you run a new test. Delete – delete a selected test result. Clear – clear the table with results completely. Load – load previous test results from file. Save – save the current test results to file. View – view the details on a selected test result (you can also view the details by double clicking on a test result in the list). When you choose the view option (by any of the two described ways), the program will open two windows. You already know the first one – it's a diagram with the test results, which you can see during the tests. The second one is new – it's a numeric representation of test results. Subtest Type – select one of the subtests, which were initially included into the test, which results will be displayed in the table. Parameter name depends of the test type. 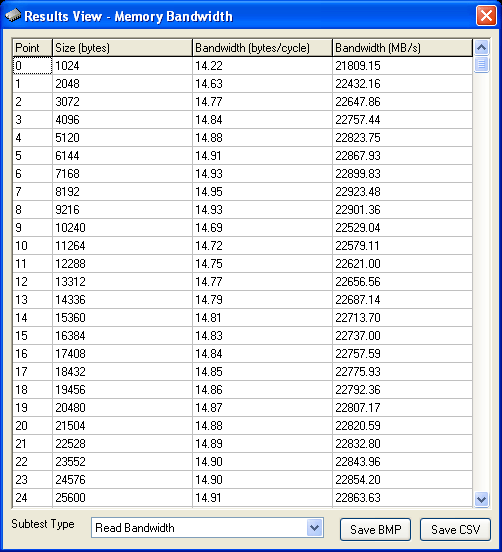 For example, in case of Memory Bandwidth test, you've got the following subtests to choose from: Read Bandwidth, Write Bandwidth and Copy Bandwidth. Save BMP – save test results in graphics form (BMP file). Save CSV – save test results in numeric format, compatible with Microsoft Excel (CSV file – Comma-Separated Values). Note that the new RMMA 3.4 still allows to save BMP and CSV files automatically in the test process. As before, this option is controlled by the Test Reports setting on the General tabbed page (the default settings is disabled). Modification of this parameter does not have an effect on writing test results into the table on the Results tabbed page – it will be done anyway. By the way, it should also be noted that all the changes you make on the General tabbed page are now stored in the config file (rmma.ini), to make the program more convenient to use. The new RMMA version now offers more information on the Platform Info tabbed page. There appeared a new item called DMI. This section provides information extracted from DMI area of BIOS, according to the latest revision of the standard – System Management BIOS Reference Specification, Version 2.3. Unfortunately, the SMBIOS (DMI) 2.3 standard is over 6 years old and it's outdated. Nevertheless, some information from the DMI area remains very useful. 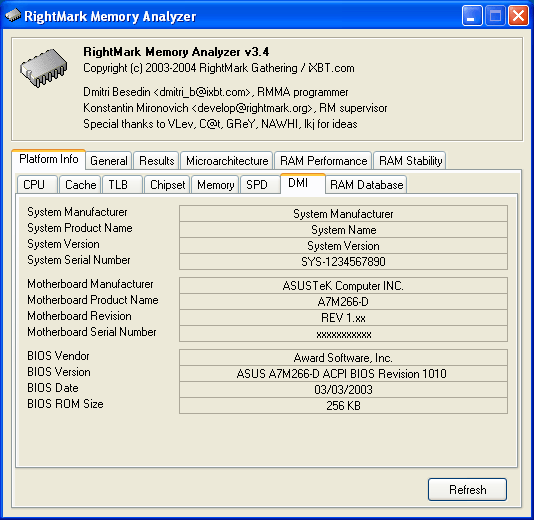 This is mainly information about a motherboard, BIOS, and a system as such (as you can see on the picture, the latter may often be quite nominal, or even not written in the DMI area at all). By the way, automatical detection of motherboard's manufacturer and model as well as the BIOS version and its manufacturer makes it much easier to submit "quick" test results into our database (which will hopefully be created soon), this setting is available on the RAM Database tabbed page. There is still only one satellite utility that comes shipped with RMMA 3.4 – it's a little application timings.exe, which can be run from command prompt irregardless of the benchmark and allows changing memory timings dynamically (as well as other important parameters). Even this utility was updated in the new version. First of all, there was added an option (by the way, in RMMA as well) to change Bank Interleave – this function is implemented in supported VIA chipsets. It's specified by the key interleave; its typical values are 0 (interleaving is disabled), 2 (interleaving two banks) and 4 (interleaving four banks). Note that RMMA 3.4 also provides information on Node Interleave, available in multi-processor AMD K8 systems. However it's impossible to change this interleave mode on the run. pci [bus] [dev] [fn] – to select a PCI device, which registers are to be modified (PCI bus, device, function). Default parameters – bus 0, device 0, function 0, which correspond to the northbridge registers of the chipset. regbit [off] [bit] [val] – to set the bit (0-7) of the 8-bit PCI register at the address off (0-FFh) to the specified value val (0/1). regbyte [off] [val] – to set the 8-bit PCI register at the address off (0-FFh) to the specified value val (0-FFh). regword [off] [val] to set the 16-bit PCI register at the address off (0-FFh, divisible by 2) to the specified value val (0-FFFFh). regdword [off] [val] – to set the 32-bit PCI register at the address off (0-FFh, divisible by 4) to the specified value val (0-FFFFFFFFh).